Job losses were registered in each of the five urban sectors between the employment peak of 2007 and the trough of 2010. Three of the urban sectors have recovered to above their 2007 employment levels. However, overall major metropolitan area employment remains lower by approximately 800,000. Since the 2010 trough, the largest numeric gains have been in the newer suburbs. The Central Business Districts (CBDs) of the Urban Core have recovered more than double their 2007 to 2010 numeric loss. 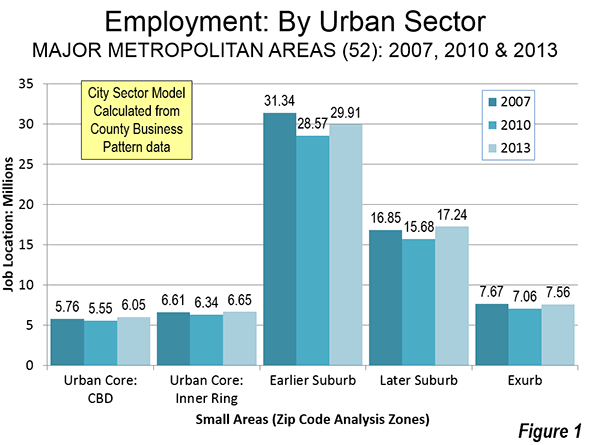 In contrast, the balance of the Urban Core, the Inner Ring experienced a modest increase over its 2007 employment peak. The exurbs have not yet fully recovered. By far the largest losses between 2007 and 2010 were in the earlier suburbs (principally inner suburbs), where employment dropped 2.8 million and has recovered less than one half of that loss (Figure 1). The dispersion and concentration is most evident in the shares of employment by urban sector (Figure 3). Three of the urban sectors increased their share of metropolitan employment between 2007 and 2013. The largest increase was in the newer suburban areas, which rose from 24.7 percent to 25.6 percent of metropolitan employment. The central business districts also increased their share of employment, from 8.4 percent in 2007 to 9.0 percent in 2013. This trend is similar to the City Observatory (Joe Courtright) findings that urban cores outperformed suburbs in job growth between 2007 and 2011. 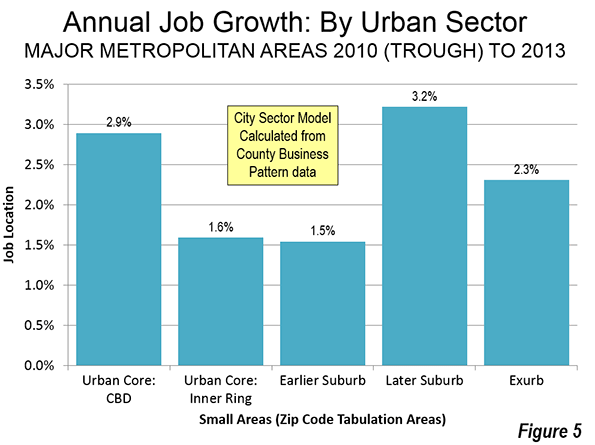 The Courtright findings were for areas within three miles of the largest city center, while the findings here relate to the generally smaller CBDs (Figure 2).The gains in other sectors were at the expense of the earlier suburbs, which experienced a loss from 45.9 percent to 44.4 percent of metropolitan employment between 2007 and 2013. Since the trough of 2010, there were numeric gains in all of the urban sectors. The gains were concentrated in the suburbs and exurbs, which accounted for 80.9 percent of the employment growth from 2010 to 2013. This nearly equals the 81.9 percent share of employment in these areas in 2007. 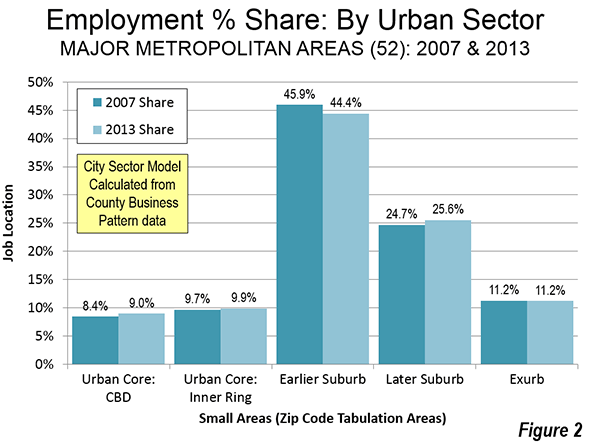 The urban core, including the CBD and inner ring, captured 19.1 percent of the 2010 to 2013 employment growth, better than their combined 18.1 percent share in 2007 (Figure 3). There was also geographic concentration in the CBD gains between the 2010 trough and 2013. 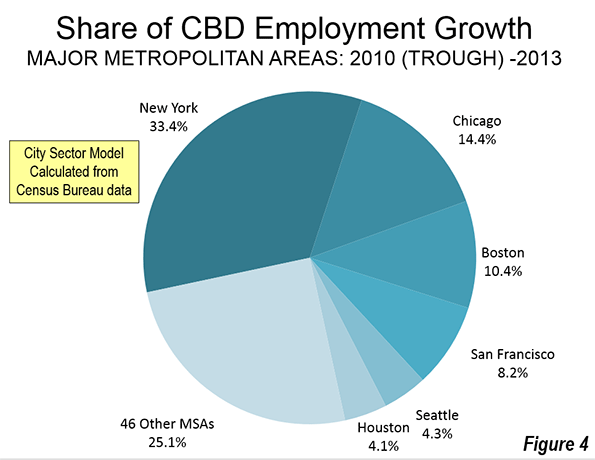 Approximately two-thirds of the CBD employment gain between 2007 and 2013 was in four metropolitan areas: New York, Chicago, Boston and San Francisco. Along with Seattle and Houston, these metropolitan areas account for 75 percent of the CBD growth. All of the 46 other major metropolitan areas contributed 25 percent of the gain (Figure 4). Between 2010 and 2013, the largest annual percentage employment gain was in the later suburbs, at 3.2 percent. The CBDs, experienced the second strongest growth at 2.9 percent. However, numeric gain in the later suburbs was more than three times that of the CBDs, due to their already much larger employment base (Figure 5). For decades, most employment growth has been outside the urban cores of the major metropolitan areas, as had been the case with residential population gains. The Great Recession interfered with these patterns, but normalcy may be returning. Brookings Institution Demographer William Frey recently commented on later population trends (through 2014), suggesting "renewed growth in suburban and exurban counties." The new data indicates renewed employment growth in suburban and exurban areas. At the same time, it would not be surprising for the revival in the CBDs to continue, even if the numbers are relatively small in the metropolitan area context, where the dominance of suburban and exurban job growth seems likely to continue. 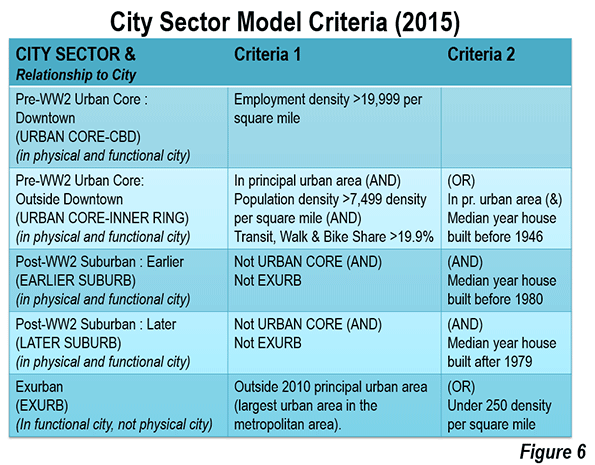 Note: The analysis is based on the City Sector Model (Figure 6), which classifies small areas (ZIP codes, more formally, ZIP Code Tabulation Areas, or ZCTAs) in metropolitan area in the nation based upon their behavioral functions as urban cores, suburbs or exurbs. The criteria used are generally employment and population densities and modes of work trip travel. The purpose of the urban core sectors is to replicate, to the best extent possible, the urban form as it existed before World War II, when urban densities were much higher and when a far larger percentage of urban travel was on transit or by walking. The suburban and exurban sectors replicate automobile oriented suburbanization that began in the 1920s and escalated strongly following World War II.